Content marketing strategy isn’t a “nice to have”—it’s a requirement. Recent research from the Content Marketing Institute found that more than 80% of B2B marketers say they have a content marketing strategy, but only a third have documented that very same content marketing strategy. Let’s fix that. Why are you doing this at all? What is content going to do for your organization? Create awareness? Generate leads? Improve loyalty and retention? 2. What’s Your One Thing? What will you create in your content marketing program that sets you apart? There is an enormous glut of content (and more on the way). Will you be disproportionately useful? Will you create Youtility (I say YES!). Will you be disproportionately motivational, inspirational, or otherwise? What is the heart and soul of your content program? Remember: give yourself permission to make the story BIGGER. Your objectives dictate your metrics. If you’re trying to generate awareness, measure that. Use the 4 categories of content marketing metrics to create a measurement framework that matters. Your objectives also dictate your audiences. Use personas to model the audiences for your content marketing. Understand them like you understand your family. Remember: always define calls-to-action. What do you want your content consumers to do NEXT? 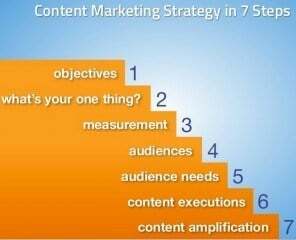 I hope you benefit from this presentation and framework for developing a content marketing strategy. If you liked this one, you might like our free ebook on the 4 types of content marketing metrics, or my recent presentation on why it might be time to completely change your social media strategy.